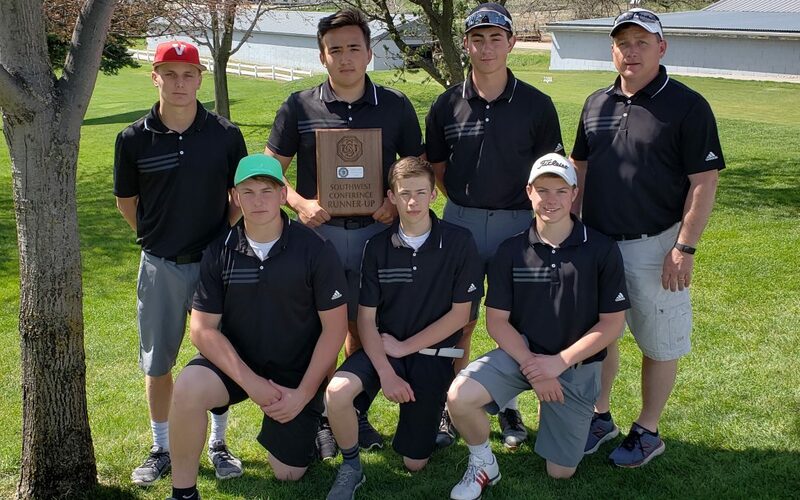 Valentine is South West Conference team Runner Up with new low team score of 345. Dylan Hathorn- 1st team all conference and 2nd place with an 80. Dillion Muirhead -2nd team all conference and 7th place with an 84. Kyle Grooms- 3rd team all conference and 14th place with an 89. Jordan Kelber tied for 15th but lost in the scorecard playoff with a 92. Grant Fisher had a score of 94. Broken Bow placed 1st with a team score of 320. Valentine 2nd with 345. Cozad 3rd with 362. Gothenburg 4th with 372. Ogallala 5th with 382 and Minden 6th with 412.